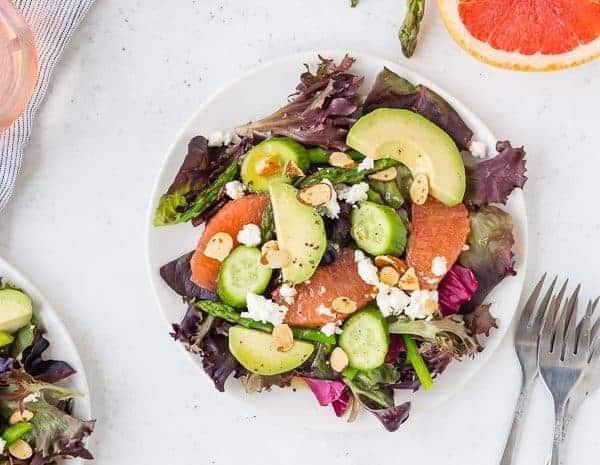 This spring salad is adorned with asparagus, grapefruit, crumbled feta, and creamy avocado. It’s topped with a flavorful rosé vinaigrette, making it perfect for brunch or a light summer meal! This blog post is in partnership with Earthbound Farm. All opinions are my own. Guyyyyyys. I put rosé in salad dressing. And I fully stand behind this decision. And you should do the same. As I write this post, I may or may not be drinking a glass of the leftover rosé. When Earthbound Farm approached me about partnering with them, it was an obvious “yes!” As you know (or maybe not, but you’re about to learn), I only partner with brands that I love and use in my home. If I wouldn’t feed it to my family, you won’t see me sharing it with you or telling you to buy it. Earthbound Farm products are on my grocery list every single week. Sometimes twice a week or even more, just ask my Shipt shoppers. I buy a lot of groceries. When they shared with me that they were releasing two new varieties of greens, and one was a Rosé Blend, I was immediately smitten. PS: The other new product is Baby Red Butter Lettuce and it is just as fantastic! Tip: When you buy greens that come in a plastic container like Earthbound Farm greens do, after you remove the first serving, fluff up the rest of the greens slightly. They pack a lot into the packages, which is awesome! Fluffing them up a little and giving them “room to breathe” will extend the life of the product. Hat tip to my mom for this advice! When I started brainstorming recipe ideas, I thought it would be fun to create a spring salad with tons of fresh, bright flavors. I don’t know about the rest of the country, but Michigan is READY FOR SPRING. Honestly, it was sunny the other day and I felt like a brand new woman that could take on the world! It’s really a mood-changer, and I’m ready for more. 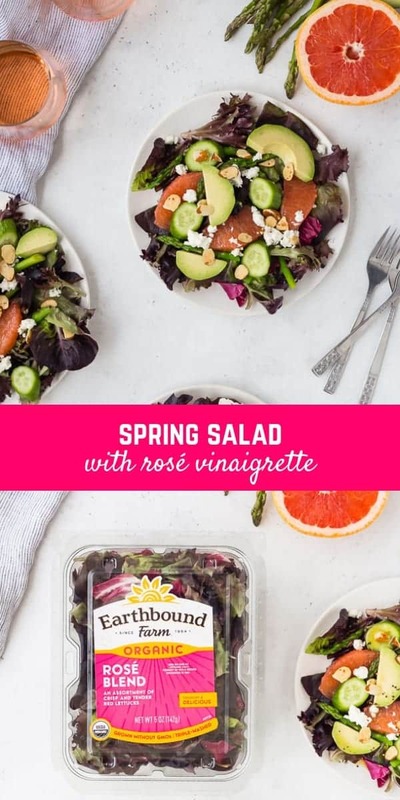 Along with the crisp springtime flavors, I wanted to really accent the fun nature of this Rosé Blend and create a flavorful vinaigrette with rosé wine. 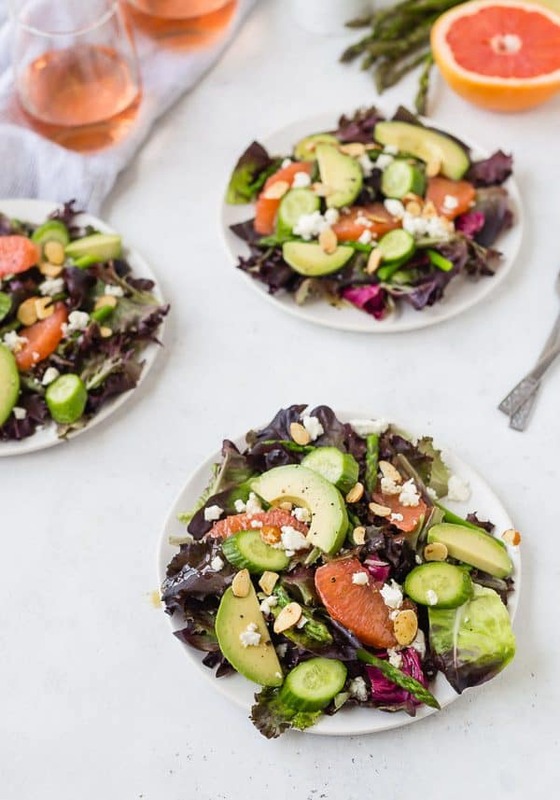 The rosé wine is a light and bright flavor in the salad dressing and is complemented with red wine vinegar, honey, dijon mustard, and a good quality olive oil. This spring salad is the perfect brunch salad, or an ideal partner to grilled salmon or grilled chicken. Both would be great on top of the salad, or alongside it. The elements of this salad give you everything you’d want in a salad. There are so many different flavors and textures in it that all play off each other perfectly. 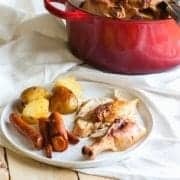 After I developed and shot this recipe, I could not stop eating it! 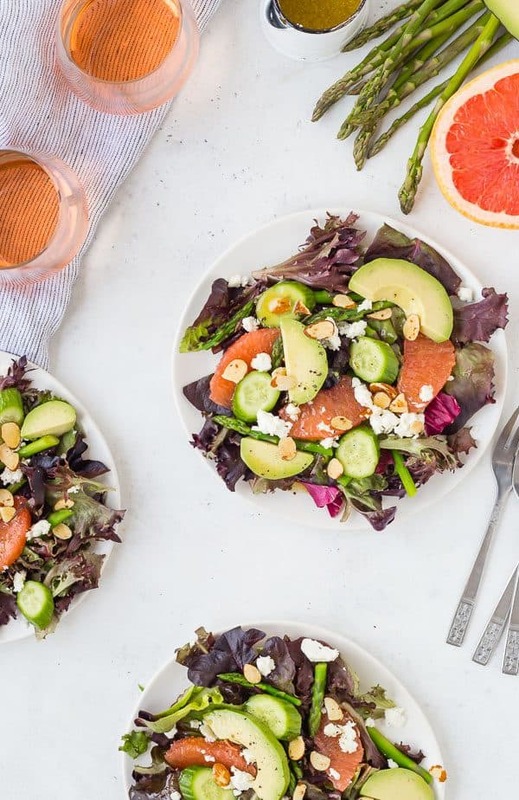 The trickiest part of this salad may be segmenting the grapefruit, if you’ve never done it before. If you’re new to this way of cutting citrus fruit, this video will be very helpful! Once you have that skill mastered, try making this citrus salad with mint, honey, and lime. 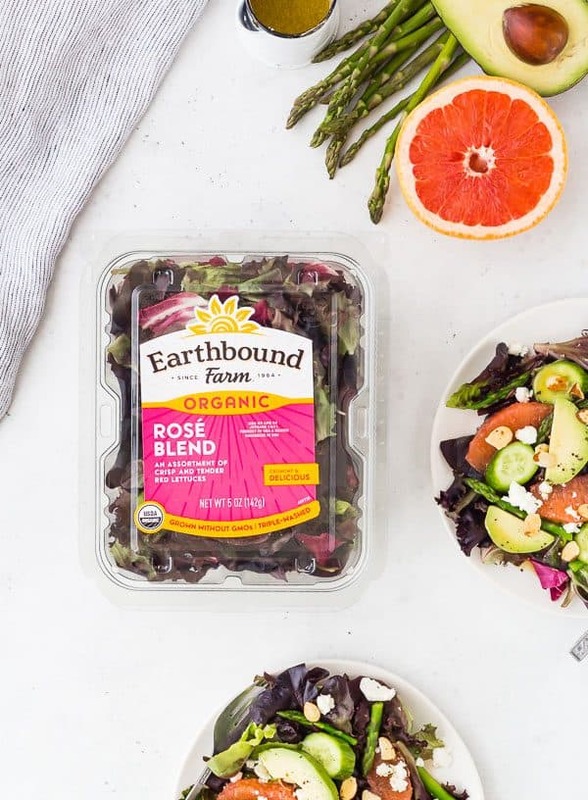 Since partnering with Earthbound Farm, it’s been fun to learn more about their history and what their brand stands for. I already knew about the reliable high-quality nature of their products, but it was interesting to dive in a little deeper. Earthbound Farm was founded 35 years ago on 2 1/2 acres and is fully committed to organic, always. That means 100% of their products are certified organic; free of toxic and conventional chemicals, synthetic fertilizers, GMOs, and irradiation. They have grown into more than 30,000 crop acres farmed organically today. One of the founders, Myra Goodman, says, “The organic industry is way too small. We don’t want organic to be an exclusive club because the benefits of organic are just too huge.” I love that philosophy! You can hear more from her in her TED talk. Coupon to try Earthbound Farm! Get a $2 off Earthbound Farm coupon for this new Rose Blend, or Baby Red Butter Lettuce here. You can find these new products at Meijer stores! If you’re a goat cheese fan, this salad would be fantastic with goat cheese instead of feta cheese. If you don’t like grapefruit, try this with orange segments. If you can’t have nuts, leave them off or try adding crispy chickpeas for that crunchy element. Try topping with grilled salmon or grilled chicken. 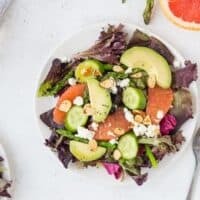 This spring salad is adorned with asparagus, grapefruit, crumbled feta, and creamy avocado. It's topped with a flavorful rosé vinaigrette, making it perfect for brunch or a light summer meal! In a dry frying pan over medium-high heat, add cut asparagus and cook, stirring, for 4-5 minutes or until tender. Remove from pan and place in an ice bath until ready to use (see note). In a small jar or a measuring cup, combine rosé wine, olive oil, vinegar, honey, mustard, salt, and pepper. Whisk or shake to combine. 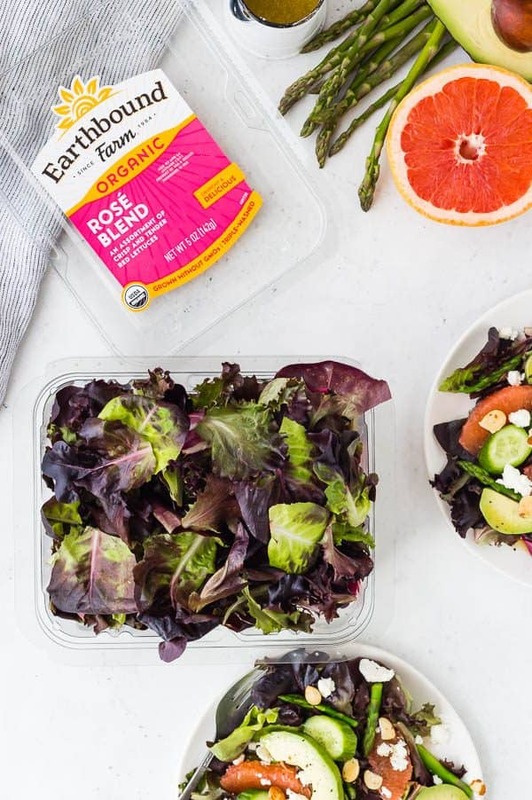 Compose salad on serving plates beginning with a layer of Earthbound Farm Rosé blend. 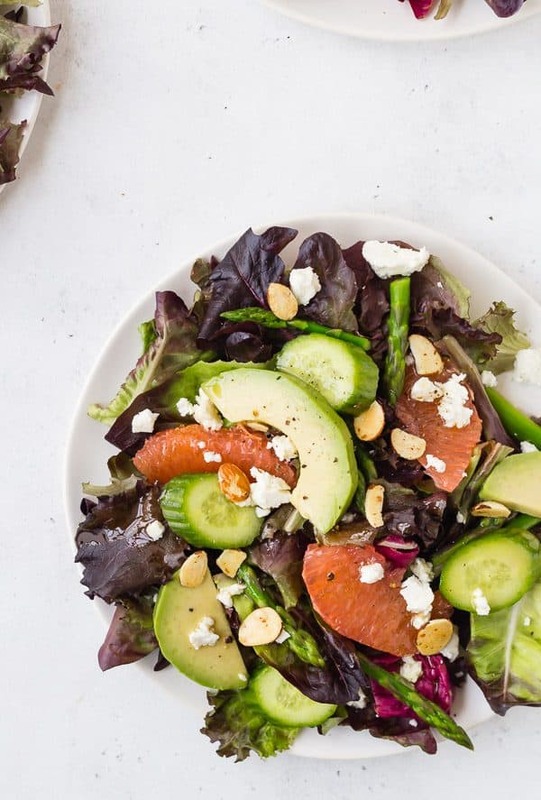 Top with grapefruit, avocado, cooked asparagus, feta, cucumber, and toasted almonds. Drizzle dressing over top of each salad and serve immediately. Topping measurements are all suggestions, feel free to add more or less of your favorite toppings. You could also put this salad in a large serving bowl and serve it family-style. Create an ice bath for the asparagus by placing a colander in a bowl of ice water. When the asparagus is done cooking, dump it into the colander which is submerged in ice water. 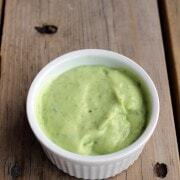 This preserves the bright green color of the asparagus and also cools it so it won't wilt the greens. When you're ready to add it to the salad, take the colander out of the ice bath, drain water, and sprinkle asparagus on the salad! 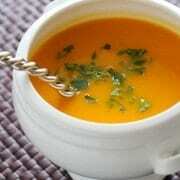 You may not use all the dressing, depending on how heavily the salad is dressed. The salad dressing is not heated, so it does contain alcohol. Use discretion when serving, and do not serve to individuals under 21 years of age. Verdict: So good! Everything works so well together in this salad. 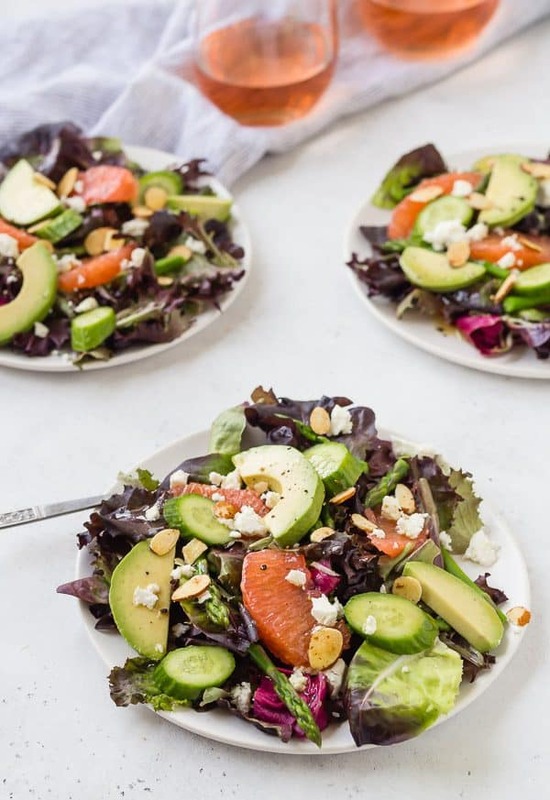 The flavorful greens, creamy avocado, tangy cheese, tart grapefruit, springy asparagus, and crunchy almonds. It’s everything you want in a salad, topped with a flavorful vinaigrette. This one is a keeper. Husband’s take: Ben loves this salad! He’s not a huge grapefruit fan…or feta…but he’s on board with the rest of it. Changes I would make: None are necessary, but if you’re looking to switch it up, try some of the suggestions I mentioned prior to the recipe. This content and recipe is in partnership with Earthbound Farm. I was compensated for my time but all opinions are, as always, my own. Thank you for supporting Rachel Cooks by reading about brands we use and love in our own home. Sponsored posts like these help me cover some of the expenses involved with keeping this site free for you to use! Thank you! So glad you like this recipe! Would you believe it is snowing in Michigan today? I love this recipe so much. As a DM, a healthy and low-carbon diet is very imporant. This spring salad seems so delicious. I will make it myself. I love Earthbound Blends. The salad dressing looks easy and tasty. Me too! Such great products. Thanks Denise!